A charity based at our Chamberlain Business Centre in Hull certainly caught the public’s attention last weekend after decorating a local landmark with hundreds of pink bras. 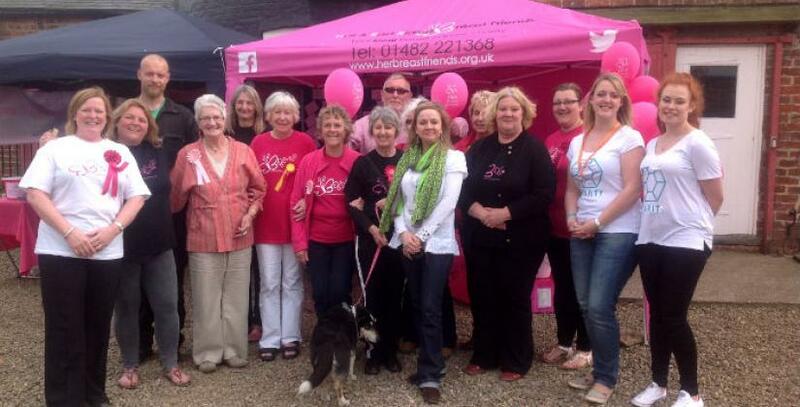 Hull & East Riding (HER) Breast Friends held its successful ‘Bras around the Windmill’ event over the bank holiday weekend. Teaming up with staff at the iconic Skidby Windmill and East Riding Council, the charity held a two-day family event that saw pink bras a plenty wrapped around the sails of the 194 year-old working mill, to serve as a colourful reminder to be breast aware. BBC Radio Humberside weather presenter, Keeley Donovan, launched the eye-catching event. Vice Chair of HER Breast Friends, Pam Trays says: “The windmill looked absolutely brilliant adorned with pink bras on its sails. That was until the strong winds came in and blew some of the bras off! The weather was atrocious but we carried on regardless. The event, attended by roughly 500 people, offered an opportunity for families to explore the beautiful working mill and grounds. A bouncy castle, soft play area and raffle prizes kindly donated by various local companies were all part of the entertainment. More than £700 was raised, which supports the charity enormously, as it does not receive any government funding. The initiative is in keeping with the charity’s values of not only providing support, but aiming to inspire, encourage, and really make a difference by helping to promote a positive approach to living with breast cancer. Celebrating its 10th anniversary this year, HER Breast Friends also held an Arts for Awareness exhibition at the weekend showcasing the work of amateur artists who have been affected by breast cancer. The exhibition can be viewed at various roadshows throughout the county and the public can vote for their favourite pieces, with winners announced in October. A whole series of events have been planned in 2015 to mark the charity’s 10 year milestone including a fashion show featuring volunteers as ‘supermodels’ in The Guildhall, Hull on 14 May and a vintage tea party and charity open day held at the charity’s premises in the Chamberlain Business Centre on 3 June which is open to the public. HER Breast Friends has been based at the Chamberlain Business Centre for the last four years, providing a central base for the breast cancer charity. Pam comments: “The charity began operating by holding meetings in church halls or people’s houses. We’ve always been looking for a permanent home, but just needed to find the right place. If you would like to work in a business centre with a strong community feel, excellent facilities such as a newly refurbished breakout area and on-site cafe and are based near Kingston upon Hull then the Chamberlain Business Centre may be the right fit for you. With a wide variety of offices, workshops, industrial and storage units, this centre can flexibly accommodate for businesses of all sizes. Free, secure, car parking facilities are available with 24-hour access. To book a viewing appointment or to find out more, contact Business Centre Manager Gillian Stockdale on 01482 214 770.